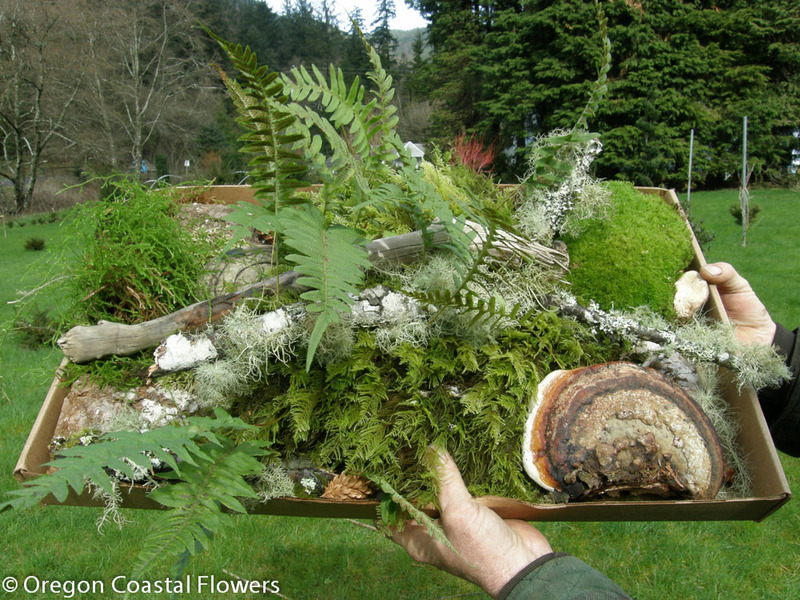 Including premium Oregon mosses, forest droppings, birch/alder poles, mossy branches, & much more. Sitka Spruce (Picea sitchensis) cones along edge of Prince william Sound near Cordova, Alaska in June. Oregon Coastal Flowers is located in the middle of Oregon State Forest land. We have a permit to harvest a multitude of specialty forest products on this land. Everything is harvested fresh and responsibly. Our moss prices are not the cheapest, however, they are extremely good quality. Our premium Oregon moss includes quality sheet moss, mood moss, forest droppings (goodies we find on the forest floor), various sizes of branded clear bags of green moss, and commodity bales of moss. In terms of branches, we harvest three types of mossy branches: grandma’s apple mossy branch, vine maple mossy, and green mossy branches. Our best selling mossy branch is the grandma’s apple. The vine maple mossy branches are the best quality. We also harvest manzanita branches and sell them in fresh, leafless, and sandblasted. If you want sandblasted manzanita please allow us two weeks to sandblast. Unfortunately, we have to drive 10 hours away to harvest manzanita on the top of a mountain. Yes, it is expensive! 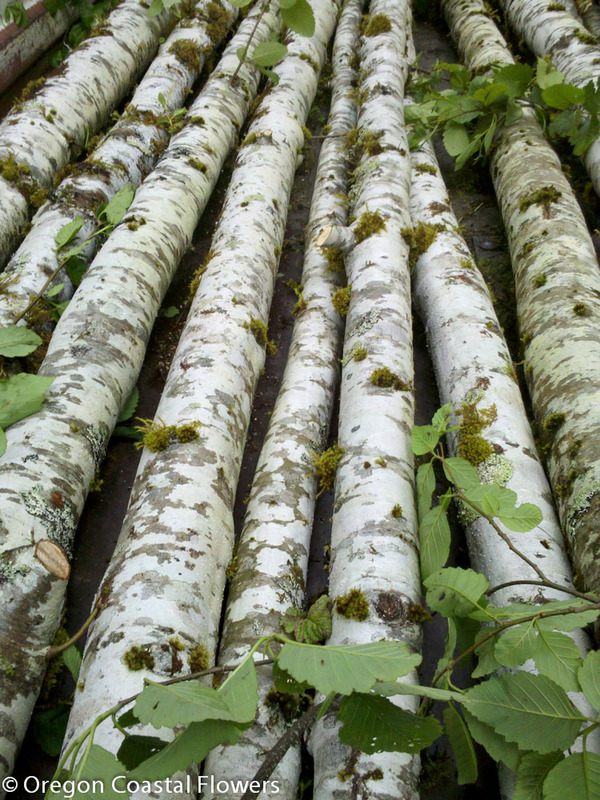 Birch/alder poles is one of our best selling items. We don’t actually sell birch poles, but rather alder poles. Alder is our native birch here on the Oregon Coast. They have a nice white color with moss and lichen. They are not as brilliant white as birch is, but most people prefer them over birch after receiving them. Specialty forest products also include various driftwood pieces we find, grape vines, logs, etc. We have special requests all the time. Ask us for what you need and we’ll likely find it. Click here to see a comprehensive photo database of our specialty forest products. Valentine's Day specialty flowering branches, pink & white branches. Forsythia branches for the Chinese New Year. Kilchis River Pumpkin Patch opening in October. Coral Charm, Red, Pink, and White Peonies. The Hydrangea Ranch is one of the Oregon Coast's most popular Wedding Venues. Wholesale, Pink, White, Red Peonies Locally Grown. Wholesale Peonies -- Lavender, Pink, & Burgundy. Japanese Magnolia Flowering Branches in full bloom on the Oregon Coast. Premium Oregon Grown Red Ilex Berries. Tall Rose Hips Available for Fall Events. Pretty, Plump, and Perfect Rose Hips. Flowering Dogwood wholesale branches now shipping. Snowball viburnum from the Oregon Coast. A herd of elk walking down main street? Only at Oregon Coastal Flowers during the Chinese New Year!